Have your previous efforts to find sponsors for your events fallen flat? Are you hoping to start the year with a big event sponsorship win? CharityHowTo can help! Knowing how to get sponsors for an event can be hard for many nonprofits because they haven’t learned to find them the right way. 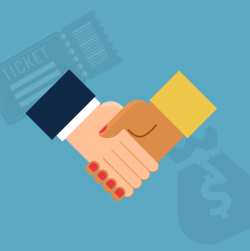 Event sponsorship is sales, not philanthropy. You have to know how and what to sell - and it’s not a mention in your gala program book. Join Joe Waters, a nationally recognized expert on event sponsorship and building win-win partnerships with businesses, as he shares tips and tactics for how to get sponsors for an event for your nonprofit. Joe will solve your toughest corporate sponsorship challenges! "Joe is awesome, insightful, and helpful for nonprofits to create a successful event and marketing sponsorship benefits package and strategy!" "Joe has a proven track record of success in this area and I enjoyed hearing tips of ways to increase our sponsorships." "Not sure if it is the Boston accent or his quick rate of speech, but Joe is very engaging. The 90-mins fly-by as all of the material is extremely applicable and informative. Am hoping to encourage my other team members to also take this nonprofit webinar in the future. Now to just try and get our Executives to take time to discuss forming our Foundation's Board!" "Joe was outstanding. I am ready to immediately apply his practical knowledge and insight to my next event." "Joe is such a knowledgeable and engaging presenter! This information and all the downloadable materials were incredibly useful! This nonprofit webinar will definitely help me push to the next level as a fundraiser." "The Event Sponsorships nonprofit webinar hosted by Joe Waters was extremely informative with lots of great tips, resources and mapping. I look forward to putting this into motion!" "This webinar was very helpful to start the creative thinking process on how to better approach finding and securing sponsors for our big event coming up. I would recommend for anyone who works for a non-profit in need of some advice/tips!" Maxann Keller, Registry of Interpreters for the Deaf, Inc.
Ellen Stein, Community Connections, Inc.
“Joe Waters is a true expert in this arena and he presents the information in a clear and approachable manner. Beginners and experienced event fundraisers can benefit from this webinar." Mary Theresa Cipolla, C.E.R.T.S. Inc.
Joe Waters is a nationally recognized writer, speaker, and consultant on sponsorship and win-win partnerships with businesses. His popular blog, Selfish Giving, has been showing businesses and nonprofits how to raise money and change the world since 2004. Joe spent 20 years in the nonprofit sector fundraising with local, regional and national businesses and has raised millions of dollars through sponsorship and cause marketing. Whether you’re seeking sponsors for a gala, walk, golf tournament or any other kind of event, Joe has your covered! He’s an energetic and entertaining speaker and you’re sure to love his charming Boston accent!